Watching Sofia sleep soundly, I can't believe I actually felt like shutting her up with a pillow earlier. Ambil bantal tekup muka dia biar senyap. Why do people posts only cute pictures of their baby? Why not share a video of them wailing and screaming? Well, because they are busy calming their babies. That's why. Huh. And a baby wailing is not a cute sight. I thought we had the wildest night when she only went to sleep before Subuh. Oh no, no, no. Last night. Well, last night she didn't sleep at all. She finally sleep at 9 am! 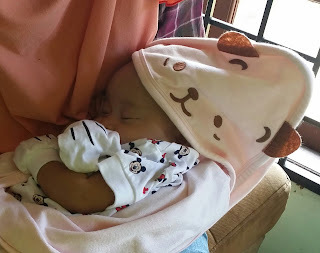 I was nursing her at about 7.30 am when she suddenly cried, and we had to give her formula milk. While waiting for mum preparing the formula milk, she kept on wailing and crying I really feel like shutting her with a pillow! Senyap lah sabar boleh tak! Instead, I looked away from her and istighfar. Let her scream let her cry, I just looked away pekakkan telinga. Heart racing, trying to calm myself down. When mum finally came and Sofia started suckling furiously (betul laju... memang lapar sangat lah tu), terus tersentak. Astaghfirullah... Sofia tak salah. Dia lapar. What was I thinking? Exactly what.was.I.thinking. There was this one time, I cut and ripped off the front opening of my blouse. Just because the zip opening wasn't long enough and Sofia was wailing like crazy. Instead of changing clothes, I grabbed a pair of scissors and cut the opening further down. That blouse, I just bought with my own salary. And of course, it couldn't be worn again. Sofia, when you grew up, get mama a new blouse okay. I ripped off my blouse just to feed you. I'm still trying to be more patient day by day now. I've always thought I'm a very patient person; dealing with waterphobic students, but when Sofia came, hats off to Iz. Alhamdulillah for such a patient husband. Confessed to Iz about my evil intention of shutting up his little princess... He said, "Bukan senang jadi mak ayah. Kalau senang, takkan ada ayah yang jahat"
Hahahaha... Sya, glad to know bukan bash sorang je macam ni.. huhu. Rasanya semua orang pun pernah rasa macamni kut.